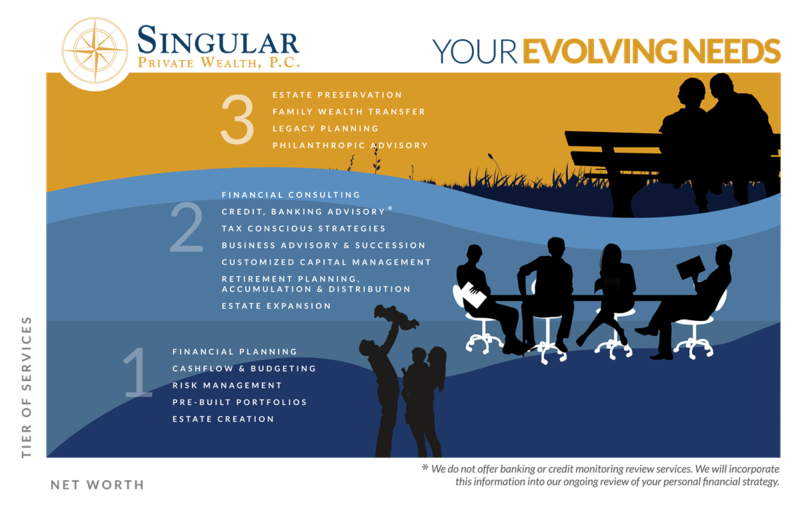 Services | Singular Private Wealth, P.C. It’s time to start feeling better about money. We are familiar with the inertia that so many of our clients have to overcome in order to initiate a conversation with a new advisor. You’re here now, and you can feel good about that. The truth is, no one wants to think about things that are outside of their control: the stock market, interest rates, the potential for long-term illness, disability or death. The only way to get this conversation behind you is to get it started. You’re not alone. We will hold your hand, educate you where needed, and provide you with options so that you can make informed decisions about the well-being of your family and your business.